The risk assessment officer for a $50 million family housing project at Kaneohe's Marine Corps Base Hawaii has filed complaints with state and federal authorities alleging that the Navy plans to leave con- taminated soil in yards where children will play. Walter Chun, a consultant for Kona-based Metcalf Construction Co. on the 212-unit project of two-story duplexes, alleges that the Navy ordered Metcalf to not remove or cover soil that has up to 32 parts per million of chlordane, which is 20 times the U.S. Environmental Protection Agency's "trigger" level of 1.6 parts per million that requires protective action. Chun recently filed complaints with the EPA and the state Department of Health about the matter. "The potential exposure to the families and children was evaluated by the Navy using faulty data, and a cavalier assumption that military families will only be exposed for six years," Chun wrote in his complaint, which he also sent to the Naval Inspector General. Don Rochon, a spokesman for the Naval Facilities Engineering Command-Pacific, said yesterday that the detection of 1.6 parts per million of chlordane in soil triggers an in-depth evaluation of the site. Chlordane and a related chemical, heptachlor, were widely used as termite pesticides until 1988, when they were banned by the EPA. Both chemicals were found in the soil at the Marine base housing project in July, as well as heptachlor-epoxide, which is formed when they interact with oxygen in the environment. Exposure to chlordane can cause gastrointestinal distress, tremors and convulsions from short-term exposure, according to the EPA. Long-term exposure can affect the nervous system and might cause cancer. The Navy Environmental Health Center decided last year that the 32 parts per million would be a safe exposure level for the enlisted families that will occupy the duplexes because their stays at any one location are usually no more than six years, Rochon said. The project is 90 percent complete, and families are expected to move in in the fall. The Navy's risk assessment says only one area, a "hot spot" with chlordane at 104 parts per million, will have to be covered with topsoil and asphalt so people will not be directly exposed to it. It also calculates that yard and utility workers who could be exposed a day or less per week over many years would not be at risk. Chun maintains that any concentration higher than 1.6 parts per million in a residential area is too high. Chun, a Honolulu resident, said he has worked in the field of risk management, occupational safety and health, and environmental protection for 37 years. » Averages contamination levels over too-large areas, which could "dilute" the impact of "potentially significant hot spots." » Allows a cancer risk that is too high, especially if people live in the housing longer than the projected six years. » Only six of 20 stockpiles of soil on the site were included in the analysis, leaving the chlordane level in 14 piles of soil unevaluated. » At least one sample of soil with a chlordane level of 57 parts per million was not included in the analysis. 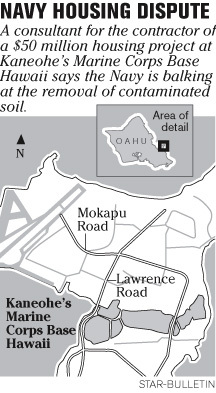 » The 1,000-square-foot area recommended for remediation is too small. Metcalf was traveling yesterday and could not be reached for comment. Chun said he would like to see any contaminated soil with 1.6 parts per million chlordane or more removed to a depth of 18 inches and replaced with clean topsoil, as the state Health Department recommends. He estimates it would add $3 million to $4 million to the project's cost. "But it would be better to do that now, before the grass and shrubs are put in and the families are living there," Chun said. After asking the Health Department about its chlordane policy last summer and fall, the Navy told Health Department officials in November that it would do its own risk assessment, Health Director Chiyome Fukino wrote in a Feb. 28 memo to Gov. Linda Lingle about chlordane contamination at the Marine base. Fukino noted that her Hazard Evaluation office "does not believe the Navy's approach for risk assessment and cleanup of chlordane was adequate ... (and) continues to question the Navy's evaluation of chlordane risk at Marine Corps Base Hawaii." The state Health Department's Solid and Hazardous Waste Branch and EPA also are looking into Chun's allegations, Grace Simmons, an environmental health specialist, confirmed yesterday. "The charges Mr. Chun has made we believe are simply untrue," said Lt. Barbara Mertz, a spokeswoman for the Navy Region. "The safety and well-being of our military members and their families is our first concern. We would never knowingly expose them to any unsafe health risk."